Lynette Hoke at an event in Southwest Asia. The Wells Fargo team member is deployed with the Minnesota National Guard. When Lynette Hoke first enlisted in the military in 2003, she was 21 and drawn to the idea of getting paid to travel the world. Today, “after multiple deployments, many months, and many years overseas,” the 36-year-old veteran says her service means even more: the ability to give back to something bigger than herself. Drag the slider bar left or right to learn more about Lynette Hoke's military and civilian life. Today, Hoke is deployed and serving as a public affairs specialist in the Minnesota National Guard. 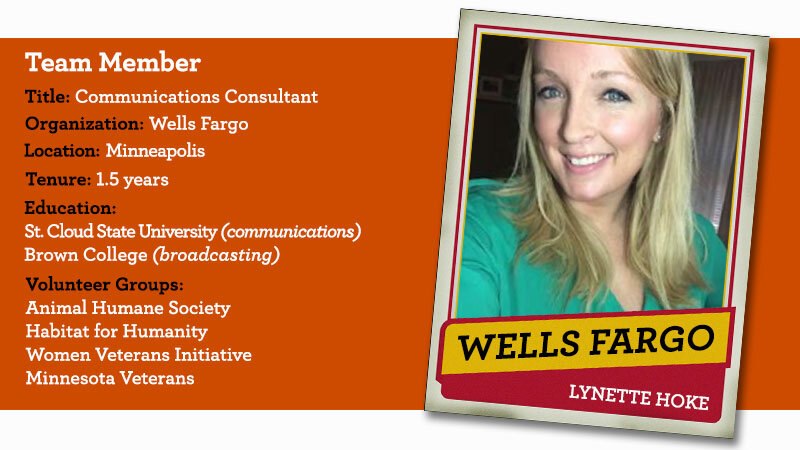 She’s also a communications consultant for Wells Fargo’s Wholesale Banking division in Minneapolis and credits the company for allowing her to serve in dual roles. Wells Fargo has made a commitment to employ military veterans, veterans with disabilities, and active military personnel. Hoke’s experience exemplifies Wells Fargo’s ongoing effort to ease the transition from military to civilian life. The company supports uniformed services team members who return to work after active duty with a variety of jobs, confidential resources, educational information, and career guidance. While serving overseas, Hoke sent dispatches about her experiences serving in the military and transitioning to a civilian role. Play the audio to hear Hoke’s answers, or read her responses below. Q: Why did you enlist in the military? A: I first enlisted with the Minnesota Army National Guard in 2003 because I was going to school with somebody of the unit that I would eventually join. She told me all about the mission that they do. At the time I was going to school for communications anyway, and it really instilled a sense of pride and an outlet that I could give back to something bigger than myself. My father was an Air Force veteran so it was kind of strange to him why I’d want to join the Army, but away I went, and in 2012, I made the jump to the Minnesota Air National Guard and have been serving ever since, still as a public affairs specialist. Q: What was it like when you first joined the Minnesota National Guard? A: When I first joined the Minnesota National Guard in 2003, after I raised my right hand and swore in, I was going to go to basic training just a few months later. My father, being an Air Force veteran, really couldn’t speak to any of the Army training that I’d be going through. That moment in my life really gave clarity to the old saying, “the fear of the unknown.” But that unknown, I got through it, and it made me a stronger, better person that I am today. Q: Why did you decide to leave active military life for civilian life? A: I really started thinking about updating my resume and expanding my professional wings when I saw my peers starting to make the same transition. Surprisingly, this transition wasn’t easy. Whether it was their position in the military and how that experience transferred to the civilian life, or just personal experiences were getting in the way, it really kind of made me think about my way ahead. Q: What did you notice when you first transitioned into a civilian job? A: Transitioning from a military career to a civilian career can be challenging for a few reasons, I believe. In the military, your success, your promotion, your way forward is usually pretty spelled out for you. As we call it, you check the box. Everybody above you knows what you need to do: check the box. Once you’ve checked all the boxes, you can go forward. In my experience with the civilian sector, things aren’t as spelled out as they were in the military. Your way forward isn’t just checking the box. It’s subjective. You need that constructive criticism. You need that feedback. And that way forward sometimes is unknown. I believe for some service members, especially depending on the job they are coming from, can really lend a lot of frustration. Q: How has your military service helped your civilian career? A: I think one of the ways my service in the Minnesota National Guard has strengthened my work ethic and expertise is in my ability to innovate. Whether I was by myself or with a team, sometimes you just don’t have what you need to get the job done, but there’s still a job to be done. And you’ll find out quickly there’s always a way to get to the end result. Q: What would you say to others who are transitioning from military to civilian life? A: One of the things I would love for transitioning veterans to know as they’re looking for civilian employment after military life is to, one, take updating your resume very seriously, and two, keep the faith that there are many companies like Wells Fargo that really support their veterans, whether you’re completely transitioning from active duty or you’re still serving on a part-time basis in the Guard or Reserve, they’re out there, and they’re out there to support your desire to serve our country.